On Feb 2, 2017 I released video from the Montgomery County Jail on Youtube. It showed the barbaric point-blank pepper spraying of the restrained inmate, Charles Alexander Wade. After they pepper sprayed him, they left him, tied down- without treating his burning eyes, for hours. Think about that. Torture, pure and simple. The way I spliced together the series of camera angles, sound and told the story of this incident garnered 31K views. I also supplied all the individual camera footage- and the handycam footage got 34K views. Every local news org EXCEPT Cox- used my footage in their coverage- which was watermarked. Cox waited several days until they could get the same footage raw- and never credited me for breaking the story. In the meantime- exploitative online sites like “Now This” recut my footage and got over a million views in less than 24 hours. Current stats 1.8M views, 1.2K comments, 6.2K shares. Another problem with this execution is Tennessee’s new protocol for lethal injection. The first drug administered in an execution is supposed to put the inmate to sleep so he can’t feel the effects of the other two drugs: the one that causes paralysis and the one that stops the heart. But midazolam, the sedative in Tennessee’s execution cocktail, doesn’t always render complete unconsciousness. It’s possible for the inmate to feel the effects of the next two drugs, and what he feels is akin to being suffocated and burned alive at the same time. And Youtube- a year and a half later- put an adult content sticker on one of the intake footage clips. As you may know, our Community Guidelines describe which content we allow – and don’t allow – on YouTube. Your video Cruel and Unusual Punishment in Montgomery County Jail – Supplemental Raw Footage was flagged to us for review. Upon review, we’ve determined that it may not be suitable for all viewers and it has been placed behind an age restriction. If you ask me- we stopped being a civilized nation a long time ago, when we declared a war on poor people and started locking them up at record speed. How we treat people in the Montgomery County Jail- with over $10M and counting in settlements should have Sotomayor pissed off, and a hell of a lot of other people- but, so far, all we have is one video- with an age restriction. 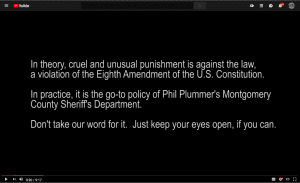 And, Phil “the Torturer” Plummer is running for State Representative… go figure. Plummer is a joke; has been a joke; and is still a joke, if he gets elected, then the joke is on us! How do we stop this barbarism that is ongoing and widespread? It is rampant, horrid, and countrywide with seemingly no way to stop it. Whoever would have thought it would come to this so quickly?….torture and murder occurring daily and often in plain site. And this absurd, canned phrase, “Stop resisting.” pisses me off so badly! WTF!!??!!?! All of these uniformed white criminals MUST be voted out of office AND prosecuted as the clear and present danger to society that they very clearly are. This type of thing occurs in third world dictatorships regularly, but should NEVER occur in the United States. It’s simply unacceptable, and the perpetrators must be prosecuted. How can you stop it when the guy keeps running unopposed? Phil Plummer is not fit to be Sheriff of Montgomery County much less a member of the Ohio legislature. Let’s hope that people wake up before election day. Wake up Montgomery County. Phill Plummer is a fabricator of lies and a mastermind of deception. He sat in power to long It time to remove this power hungry sheriff before he causes the taxes to go up again with another law suit.